I’ve curated a Flickr gallery to reflect my road trip. 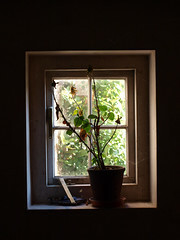 All photographs by other people, as shown in the gallery. Some literal, some quirky. Enjoy. The final day of my trip. I woke a little earlier than usual and managed to get into the shower before 9.30, which was when I’d told Val, the landlady of the guest house, that I’d be wanting breakfast. I’d had a great night’s sleep after a peaceful evening in front of the TV and my laptop and was glad I’d sorted out my bags the night before. I wasn’t particularly hungry so I just had some melon and a couple of pieces of toast for breakfast, and some coffee. I met the resident greyhounds, which explained the sudden appearance of some soft toys in the hallway when I’d gone to the toilet the evening before. After breakfast I finished off my packing and put my bags in the car. I went to settle up with Val and was horrified to learn that she didn’t accept debit cards. It really hadn’t occurred to me that she wouldn’t, but as she explained, she only has three rooms so as such a small business, it wasn’t worth her while registering to accept them. I had some cash on my but was three pounds short. I asked if there was a nearby cashpoint. At first she said there was one in the town, but then change her mind and said not to worry about it, that she’d accept what I had on me. I was mortified, of course. I apologised profusely and promised to send her a cheque for the remainder when I got home. I left with a very red face I can tell you. 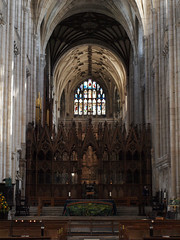 Winchester Cathedral - just a little bit splendid. Click the photo for a larger version. Winchester wasn’t far away and I’d programmed Sean Connery (sat nav) to lead me to a car park in the centre and near the cathedral. Payed for parking by phone again (all my details carrying through from York to Lincoln to Winchester – just had to enter the card security code each time) and set off. Another day of glorious sunshine and I was pleased that my last day of freedom was so bright and cheerful looking. When I got to the cathedral there was a huge queue outside the main door. I wasn’t sure if I was at the right part to get in and asked one chap who was waiting if that was the queue, but he said he didn’t know anything. He wasn’t very helpful at all – he was in the queue so what was it that he didn’t know I wonder? Odd. So I went to the gift shop and, of course, spent some money. 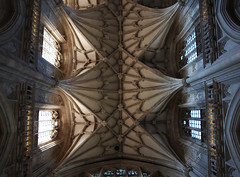 The magnificent ceiling. Yes, I did get a little giddy taking this one. When I came out of the shop, the queue had gone and I went in. I could have paid the student rate entrance fee but for the normal price of £6 I could get a pass for a whole year as it would count as a donation (not quite sure how it works out for them, but I did it anyway as they were promoting it). I spent some time photographing the windows and the architecture before trying to locate The Crypt – the reason for my visit and the place where Antony Gormley’s “Sound II” stands. I discovered the area closed because of a Holy Communion service that was going on, so I continued my tour of the huge and very ornate cathedral while I waited. The ceiling is magnificent and there were very many stained glass windows as you can imagine. The largest window above the entrance (don’t ask me about points of the compass nor the architectural parts of a church – I will learn about them soon) was very interesting in that it seemed to have no pattern. I took a better look and could see that it had been made from random pieces of glass which had obviously been decorated as part of larger images. It was like a messed up jigsaw puzzle. 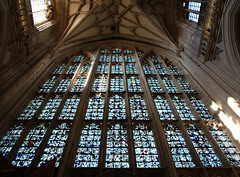 I later learned that the original window had been made in the 14th century but destroyed in 1642 during the Civil War. It was reassembled randomly in 1660 when the monarchy was restored. The light inside was splendid and I was treated to several bursts of strong sunlight which was picked up magnificently by the masonry. I also noticed that the place was riddled with graffiti. 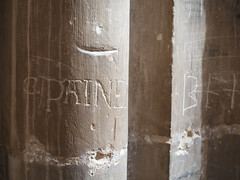 I didn’t see it straight away because it wasn’t drawn or painted on, but carved into the stone. Some was the crude scrawlings that we are used to seeing on doors and benches, but some was quite ornate in a Roman serifed font kind of way. Educated vandals? There were so many little chapels in the building I lost count. 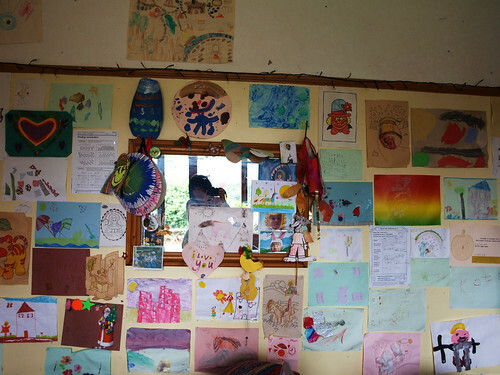 Many were the size of your average double bedroom, some a little larger, and some were very small, often dedicated to someone whose memorial was within. 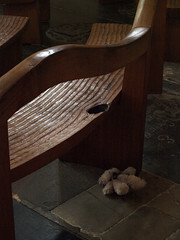 I was quite taken with the Children’s Chapel – though it didn’t seem particularly jolly, with skulls on one of the carvings – because the sign outside said that toys etc were welcome and there was a plastic table and chairs inside with a few toys already there. They seemed very incongruous inside the medieval surroundings, but it was interesting. I took so many photos at Winchester (and in other places along the trip) that I have realised one ‘Road Trip’ set on Flickr isn’t going to be enough. There will definitely be a whole set for the cathedral and it’s going to take some time to process all the photos. 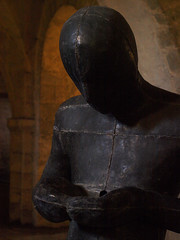 Antony Gormley's Sound II - up close and personal. 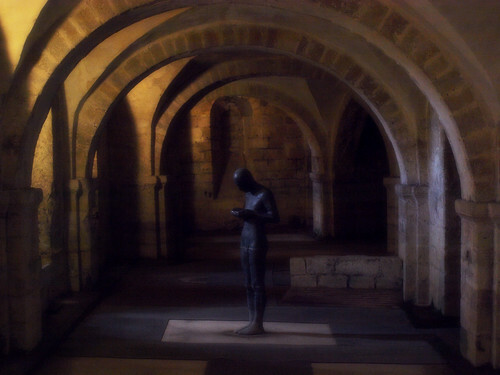 The Crypt, Winchester Cathedral. Eventually I got to the Crypt. I went down the stairs and saw the Gormley statue in the distance, behind an iron gate. On the other side were some people and a guide. I hadn’t wanted to go on a tour but was told it was the only way I could get the other side of the gate, and therefore close to the statue, so I changed my mind. I wasn’t really listening to what the guide was saying and I think I might have been irritating her a little, but the other people didn’t seem to mind at all and most of them took a few photos along the way. Just not as many as I did. It was very dark and I did struggle to get photos in the time allowed – she did have to ask me to keep up with the group at one point. We had to keep to the mats on the ground as the medieval floor could get damaged. She explained that the Crypt sometimes floods and I kind of wished it had been, just for the reflections. I’ll keep an eye on the Winchester weather this winter and maybe go there again when it’s flooded. We toured right around the Crypt and the light again was fabulous – particularly bright in contrast to the gloom of the underground passages. Some old statues and wall carvings were stored there because, as the cathedral is a Grade I listed building, nothing can be got rid of. One statue was made from stone from the Isle of Wight. I think the guide was a little irritable anyway because one woman asked a lot of questions (it was obvious she had done a lot of reading around the subjects discussed) and I don’t think the guide knew all the answers. No need to be tetchy about it though. When we came back out she asked “did you get all your photos?” – maybe I imagined the reproach in her voice. When the gates were locked again I stopped to take a few more photos of the statue before climbing back up the stairs to the main cathedral. I was happy. I’d got what I’d come for, and I left. I had a little time before my parking ran out so had a little wander through the shops and sat for a coffee and some blueberry swirl cheesecake in Starbucks. Again, BTOpenzone failed me and my iPhone. Then it was back on the road for the final journey to Portsmouth and then the island. I can’t believe I did it. When I made the plans it seemed like too much, although I was determined to give it a go. I thought I would be far more tired than I ever was (and I did get quite tired a few times, but nowhere near what I anticipated) and I expected to get rained on and to be cold a lot of the time. As it was the weather was mostly brilliant sunshine, with only a few overcast spells, and temperatures remained warm but not too warm (I’m not a fan of the summer but this was ideal). I spent time catching up with old friends, and quality time with newer friends who I don’t see often enough, or for long enough normally. I have come home feeling energised. I was overwhelmed by the welcomes and hospitality I received everywhere I went and would like publicly to thank Fiona & Nick; Eira & Sean; Brenda; Jane; Victoria & Craig; Fil & Simon; and Keith for putting me up and feeding me. Thanks also to Nik & Shay and Mandy for very welcome refreshment breaks on my longest day; and to Pippa & David; Urth; Zöe & Madeleine; Anne & Mauro; Alison & Jon; Steve; Huw; Shirley; Jason; Ozzie & Janine; Sharon; Fi & James; and Andy for their company at various stops along the way, and to Stephen for his company at the start of the trip and for lending me the money to make it possible. Thank you all for being part of my road trip – it was an absolute blast and did me the power of good. I have been asked to keep going with this blog. I can’t promise particularly regular posts, nor frequent ones, but I will try to post something when there is anything of note to report – such as days out taking photos, and perhaps some research expeditions. Don’t hold your breath, but feel free to prod me if I lapse. And thank you all for reading this far. All 1,526 miles of it! What a trip! Thanks to everyone who was part of it. Left Keef’s in plenty of time in the morning and got myself and the car round to the local Peugeot dealers – Perry’s in Aylesbury – who Keef said would be able to look at my broken plastic. Indeed they did and I got a free coffee and they didn’t even charge me a penny. They removed the piece as I’d hoped they would, but also mentioned that my rear brakes could do with dismantling and putting back together again (I think that’s what he said) and that my exhaust was ‘blowing a bit’. Hmmm. I expect the brakes have taken a bit of a bashing during this trip – I’ve done nearly one and a half thousand miles so far – but I don’t know about the exhaust – not quite sure how that all works with usage etc. Will take it to the garage when I get home. After the grant and loan money from uni is in anyway. It was MOTd four months ago and that cost me plenty. I decided to go straight to Ivinghoe Aston. I’d chatted with Keef about this the night before and initially I was going to go to Ivinghoe library (though that is closed Wednesdays) to find out where I would need to go for records etc on a future and longer visit. Keef suggested I go to the County Library in Aylesbury but as it was already lunchtime and I was hungry, I thought I could do all of that from home via the internet. It didn’t take long to get to Ivinghoe Aston. This is the little village where my great-grandfather and his parents were born – and possibly their parents too. I have done a lot of research on my great-grandfather (Christopher Horn, 1844 – 1931), but most of that has been in Bushey, Hertfordshire, where he lived from around 1884 until his death. He was a grocer there and also in Tring (which I will visit next time). His father was the grocer in Ivinghoe Aston. 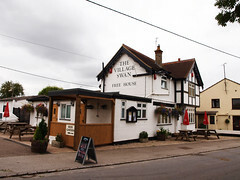 I went straight to the pub – The Village Swan – which was bought by some of the residents of Ivinghoe Aston in 1997 to stop it being closed. I mentioned that my great-great-great grandfather (and his wife) had been born in the village and that he had been the grocer, and the landlord told me that the grocery had been next door to the pub – the old Post Office. He wasn’t forthcoming with any more information and wasn’t in the least bit curious about my quest so I went and sat down and left him to his potato mashing. 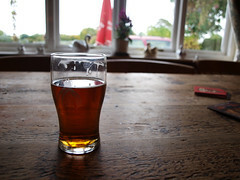 I had a half of local beer (can’t remember what it was called now, unfortunately, but it was lovely. Shame I couldn’t say the same for the veggie lasange. It came with chips that tasted of old oil, some very ordinary garlic bread, and the lasagne itself was really not very nice at all. Being very British about it of course, and still hoping for a little more information, I made the excuse that I’d had a big breakfast when the landlady asked if it had been ok, on seeing much of it uneaten. In 1851 William Horn and his wife Charlotte lived here - he was a "grocer and carrier". By 1881 Charlotte had died and William had remarried. He was still there in 1901, aged 85. 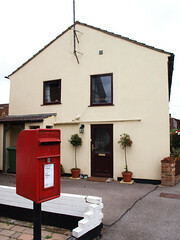 When I went out I discovered to my great disappointment that The Old Post Office was now someone’s home. The pub is now the only ‘outlet’ of any kind in the village. I should have asked more questions but wanted to sit there savouring the idea that I was soon to enter the shop where my great-great-great grandparents had traded. There are very few older buildings there – lots of modern houses (which I had seen from Google Earth some time ago). The Wesleyan Chapel is also someone’s home. As I was driving out I realised I’d missed the old school house – nowhere to stop by then and the rain had started. I went on to Ivinghoe to look at the church and see if I could find any gravestones. I did find a few bearing the name Horn, but no sign of any of ‘mine’. There aren’t many old gravestones there – though quite a lot of very recent ones – so I guess they’ve been moved or have been damaged. I will need to check the burial records I think. 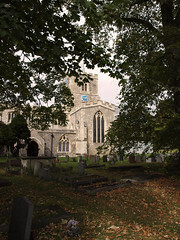 There was a huge hook on a wall near the church which had been used for getting thatch off roofs to prevent the spread of fires, and a man trap. Rather gruesome both of them. From Ivinghoe I drove to Wallingford. By accident of my father’s job at the time, I was born there. We left when I was two years old and I’ve never had cause to go there since. So I thought I’d take a look. I found the house we lived in when I was born (well I assume it was the same one – though it might have been fairly new back then) but it was in a cul-de-sac and it would have felt a bit odd to get out of the car to take a photo of it. Seemed a bit intrusive because of the way the street was. I drove back towards the town and parked the car. Popped into the local museum and asked about the hospital. Apparently the old maternity hospital where I would have been born had long gone and the site had been built on. The rest of the conversation involved me listening to the two ladies who were on the desk arguing with one another about what exactly it had been that they’d seen when they went to Winchester together (I’d told them I was headed there) and the price of the postcards I was trying to buy. Sweet. I did think I might stay the night in Wallingford because it was getting on for teatime and I wasn’t having much luck finding a B&B in Winchester. Unfortunately the only two places I found online that were within my price range were no longer operating, and a couple I found on the Tourist Information computer were booked up. So I tried some more Winchester places and didn’t worry about being close to the centre, thinking I could drive in and park up in the morning anyway. Finally found a guest house in Alresford and headed off, calling for petrol on the way and missing a turning, so taking a little longer than I should have done. No matter – that’s what this road trip is all about. Adventures rightly considered. Spent a bit of time sorting out my bags so I wouldn’t have much to do in the morning and got the laptop out to write up my blogs (no wifi unfortunately), watch TV and tuck in to the food I’d bought at M&S Food at the service station. Nice to have a quiet evening and a chance to chill a little before the final day. The idea was that it would induce an earlier start in the morning. I’m full of ideas me. Fil and Simon had gone to work by the time I woke up so I had Pig (their mad but gorgeous dog) for company while I got some coffee down me and sorted out my bags. The original plan was to drive to Ivinghoe for a daytime look around before going to Keef’s in the evening. However, I was by now desperate for internet (the blog was getting woefully behind and I needed to check the DILO group on Flickr because today was the day – it’s a quarterly event on the solstices and equinoxes). 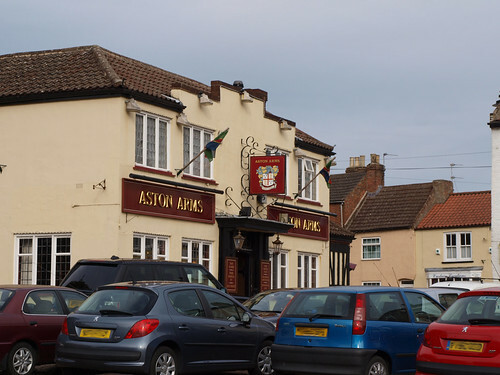 So I decided to pop back to Lincoln for a proper look around and to avail myself of the Prince of Wales pub’s wifi.I parked in the car park that I’d missed the day before and again paid for the parking by phone – it worked straight away this time. I arrived before midday and the Prince of Wales was not yet open so I wandered off in the direction of the main part of town, grabbing a map along the way. It was with the map that I found the shops. As I was going down the hill towards them I noted how steep it was and considered that I would have to come back up it in a while – and I was laden with bags because I don’t leave my laptop or my camera in the car. The exuberant Pig. This is overexposed but I'm amazed I caught her at all - she was a blur. The centre of Lincoln looked wonderful but I didn’t want to spend too much time exploring so settled for a quick look around Primark for another pair of leggings (I’ve not worn my jeans because it’s been so warm during this trip) and a visit to the loo. The ladies’ toilets were up three short flights of stairs and were in a huge area of an old building – seemed a bit of a waste of the available space and of course was no good for anyone with mobility difficulties. There was a ‘baby room’ there but I don’t know how parents would be expected to lug a buggy up the stairs with a child in their arms. I decided to brave the hill. Before I started to climb though, I stopped to take a photo or two. On the corner near me were two women also taking photos and I heard one ask the other if she was a tourist or a local. The women were both local and when I went over to the same vantage point the woman there asked me the same thing. Great opening gambit to tell me her life story and how the she was well known to the people of Lincoln and that they all looked down their noses at her because she was a pagan and spoke her mind. She told me all about her problems and her life and how she’s doing this that and the other. I did manage to get away eventually but the hill was so steep it wasn’t easy to make a quick getaway. I think she stands on that corner knowing she’ll encounter tourists who haven’t yet had the pleasure. The locals, presumably, are wise to it. I took the hill in two phases and it wasn’t as bad as I thought it was going to be. I headed to the Prince of Wales and ordered food. The guy who had been there the previous day was again behind the bar. Great service and there was some great music playing – Ian Dury when I walked in, and similar quality during my time there. I had a Brie and cranberry sandwich with lovely chunky chips with the skins on. Really tasty, reasonably priced too. I was told I could plug my laptop into the mains if I wanted. Spent the time catching up online, uploading some photos and adding three posts to this blog. When I paid I was told that my second coffee was on the house. 🙂 Fantastic. 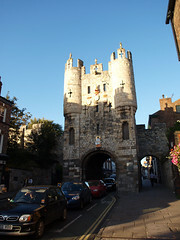 If you live in or near Lincoln, or if you visit – go to the Prince of Wales at Bailgate. Fantastic! With my wonderful sense of direction, geography and timing, I hadn’t realised that I’d left it too late to get to Ivinghoe before Keef’s (he’d texted me to explain this, lol) so I went straight to Aylesbury. On the way the piece of plastic under the front of my car started to scrape and flap about again. I pulled over and could see that it had become more damaged and this larger piece was now even more difficult to tuck out of the way. It dislodged and scraped every time I turned right. Roundabouts were a nightmare and I was going slowly and really annoying the people behind me I’m sure. I’d pulled off the main road and went towards a place called Crick. By now it was nearly 5.30 so I knew I wouldn’t find a garage open. I texted Keef to say I’d be a bit longer getting to him than I’d hoped, and limped along the quieter roads, stopping once more to adjust the plastic. Finally got to Aylesbury. Fi was there with Jacob and Rosie but they weren’t able to stay long as it was a school night. 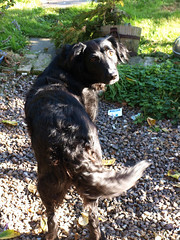 Soon Sharon arrived with the lovely Murphy (a gorgeous chocolate labrador) and the evening began. Andy called over (sadly I’d arrived too late to meet his gorgeous baby daughter Daisy as she was in bed) and later James. Keef’s delicious chili fed us all and there was still some to spare. Lovely evening and Keef’s playlist was spookily right up my street (he’d done his homework!). 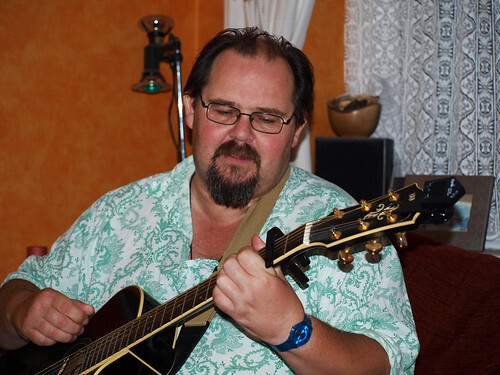 Soon everyone had headed off home and Keef and I got into a conversation about music, key changes (inspired by Chris Evans’ radio show that I’d heard in the car), stolen riffs and more. After burning a CD for my journey, Keef treated me to a couple of medleys sung and played on the guitar. He’s a talented lad, and as with the other festival friends I’d stayed with on this trip, it was great to spend some quality time rather than just a few moments here and there in a field. I left Victoria and Craig’s place at 11am. 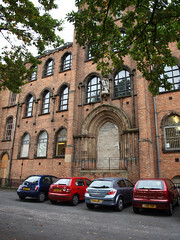 There were three places in Leeds on Stephen’s list of his father’s stained glass windows and we had found out the location of one – St Michael’s College – online. I set the sat nav and went along to the old building which is now used by the Crypt (a charitable organisation connected to the Catholic church). I could see that the windows were plain and that some were boarded up (and one bricked up) so I wasn’t too hopeful. I asked at reception and spoke with the priest who told me that there were no stained glass windows there now. He thought one of the junior priests might know where the archive information had been taken when they had moved into the building and, after a request that I sign in and use the anti bacterial hand gel (which is pointless – doesn’t kill anything and most people don’t cover their entire hands in it anyway) I was taken through to speak with this younger priest. He gave me the address of where the archives are held and the phone number of the Dean of Leeds Cathedral. Then I thought I’d try The Sacred Heart (that’s all the info Stephen had) as the sat nav said it was just over a mile away. When I got there it was a flat-roofed modern primary school building. Maybe it was on the site of the older building, maybe they were unrelated. With only my iPhone on a 3G connection I wasn’t about to start new research from the car so I decided to continue with my journey south and headed off for Market Rasen. Perhaps they were trying to entice people who are not vegetarian to eat these dishes, just to make it worth their while having them on the menu. Had a lovely couple of hours with Jason in Market Rasen. We had a pub lunch. 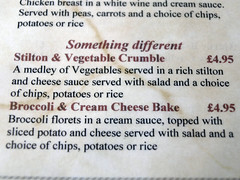 At first I thought there were no vegetarian options on the menu but finally found them under the heading “something different” – just two dishes. I found that quite funny. I gave Jason back the key ring that had been on the keys for the Mini Clubman Estate he had given me in 2002. The key ring was a Lego man and he’d been called Mr Spigot after Dudley Moore’s character in Pete & Dudley’s ‘Tarzan’ sketch, as he only had one leg (and one hand). Under my care, Mr Spigot had managed to lose the other leg and another hand, but his face and crash helmet are still intact. I also filled in the vehicle registration documents to sign the Mini back over to him. The plan is that his friend’s father on the island will take a look at it and see if it is possible to get it back on the road. I do hope it can be done. I went into Boots and managed to get some photos printed for the postcards. This time I used my ‘proper’ memory stick – I think the little one I’d used previously must have been faulty. 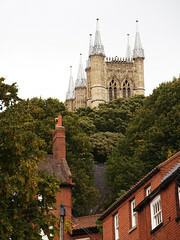 I decided to go into Lincoln to see if I could find somewhere with wifi and just have a general look around. It was still fairly early in the day and I didn’t have far to go to get to Simon & Fil’s, and they wouldn’t be home from work yet. The sat nav managed to confuse me when I got into the city and I failed to find the car park I’d Googled. The alternative (after driving round three times) was half an hour’s kerbside parking. I managed to stretch that out to 40 minutes while I had a cup of coffee in the Prince of Wales and use their wifi. Uploaded a few photos to Flickr and sent a tweet and that was that. Didn’t really have time to complete a blog entry as well. As I left Lincoln, I found the car park just around a corner I’d not seen earlier. Drat. It wasn’t long before I was through Newark and into Barnby in the Willows (what a wonderful name). Easily found Simon & Fil’s place – wonderful house, just fabulous – and again had a fantastic welcome. Kevin and Janine came round too and we all had a lovely evening chatting and chilling. It really has been a treat to spend so much time with people I ‘converse’ with more online than I do in real life. We don’t camp together at Glastonbury so I don’t get much time with any of them there (though Nik and Shay were right next to us in the Family Field this year, we were all off doing our own things) – I must try to do more of this next year, it’s great! Because Barnby in the Willows is in the middle of nowhere, the internet providings are a little dodgy so no uploading again. However I did have postcards to write and was able to type up some blog entries to paste in later on. They are longer as a result and for this I apologise! Another day with not many photos. Me up north - not grim at all. Plans … what are they eh? The idea had been to set out for the Angel of the North quite early in the day and then travel down to Leeds. 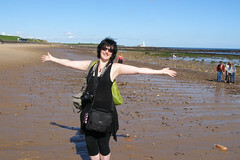 However, Jane suggested a walk along the beach at Whitley Bay and it was such a lovely day I couldn’t refuse. They say “it’s grim up north” but really this isn’t true. I think they’ve been making it up just to get attention. The sunshine was glorious and at one point I was actually hot. And this with no cardi on, walking along a beach alongside the North Sea. Before I knew it, it was almost 1pm so we said our goodbyes and I left for Gateshead. 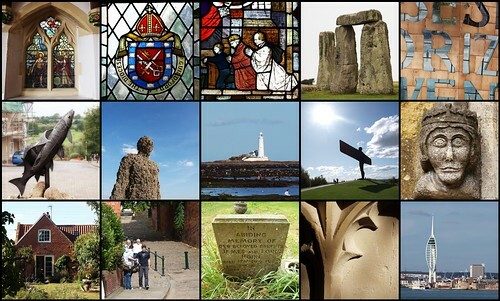 I had seen the shadowy figure of the Angel the previous night on my way to Whitley Bay and was very excited about getting there because this was the reason my road trip became more than just a visit to a few friends. I wasn’t disappointed – it’s wonderful. Like Stonehenge, I’ve heard people saying it’s not as big as they thought it would be. It’s HUGE! I don’t know what people are expecting. 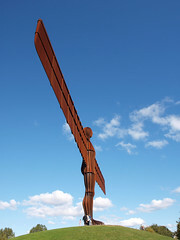 The Angel of the North - seeing this was another ambition fulfilled. Needless to say I took hundreds of photographs – I know I won’t get anything that’s not been done before but it was a joy to shoot. The light, again, was glorious. I was even happy that there were people around its feet and the hill surrounding it. 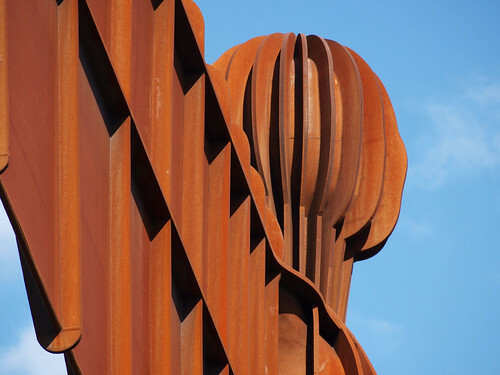 Normally I’d want an unadulterated shot but this is public art at its best – so the public should really be included. It was fun watching people go further and further back to get it all in (not easy, even with a wide angle). And yes, I did just stop to look at it as well as taking photos. I have learned to do this over the years – though it did take me a while to realise I was seeing everything through a lense. I have improved. Off again and this time heading for York where I’d originally planned to have lunch and meet up with Cheeky. It turned out she wasn’t coming into York this weekend so I didn’t worry too much about timing. On the way there I heard a clunk on the car on the passenger side and it seemed as though a stone had hit the underside. I wasn’t unduly worried but then I could hear a regular clicking sound. I also thought I could sense that something was hitting the road to make that sound so I pulled onto the hard shoulder. I checked the front of the car and there was indeed a piece of plastic from under the front, hanging down and touching the ground. I moved it back and up, checked again and could find nothing else. I set off again but the sound came back. It seemed to get worse when I was doing about 50 or 60 mph and I decided to get off the main road. I turned off for Darlington and noticed that it started scraping when I got down to 30 mph. Of course it was Sunday so the first garage type place I passed was closed. Then, just as I was getting into Darlington itself I spotted a motor parts and accessories shop. I pulled over and went in – said I realised it wasn’t what they did there but would someone be able to take a quick look at my car to confirm (or otherwise) that there was no more damage to my car than this bit of plastic. I really just wanted another opinion for peace of mind. They were lovely and the one guy got down on the floor and said it had come away because my tyres were a bit too wide and that had dislodged it. He tucked it away properly for me and when I drove off it was fine again. They were Motormania in Darlington – go and buy lots of things from them. I arrived in York as the light was going. So I was on my way again and finally made it to York. The car parking was interesting. I didn’t have enough change on me so tried to pay for parking by phone. It wouldn’t work and I didn’t know what to do except try again. Another failure. So I decided to try to enter my card details again and I think I must have miskeyed it the first time because after that it accepted my security code and payment. I felt a bit odd walking away without a ticket to display on the car though. I walked into the central part of the city (inside the wall) to discover that I had missed the York Food Festival and that the light had gone from the buildings. No matter – I just wanted a cuppa so after a short walk around the town I went to the Bridge Street Cafe and had a lovely mug of tea and some onion rings to keep me going. This after having no change again had caused me to lurk around the ladies’ loo until someone came out of a cubicle so I could get in without putting a coin in the slot. I was so good at the start of the journey about remembering to keep change but had run low. Finally I got myself to Leeds and arrived at Victoria and Craig’s. It was lovely to see them both and spend some proper time with them. I have seen them both at Glastonbury many times in the past but never had the chance to chat to either of them for any length of time. They made me feel very welcome and I had a lovely evening there with them. Lovely Thai takeaway too – yum! Oh and the most comfortable bed so far on the trip. 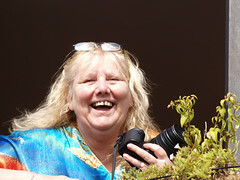 Brenda seeing me off from her balcony - she's dead posh. Left Brenda’s later than planned – about 11.30 – and headed off to Bradford after a breakfast of three oatcakes with cheese. Was very tired en route – presumably on account of the oatcakes – so pulled over to services for a sit. Carried on to Nik and Shay’s in Bradford. I was struck by the lovely bricks – golden coloured but stained black by the heavy industry of the area. On the way the road rose up over what I assumed were moors on either side – mostly empty apart from a few buildings, and also not many cars on the road with me. It felt like I was on my own there. Nik said it was part of the M62, Saddleworth Moor – the highest (above sea level) stretch of motorway in the country. Grabbed my daily self portrait in Nik and Shay's mirror, surrounded by Aoife's art. Had a wonderful Indian meal – a takeaway from their local Gujurati restaurant which was a welcome change from the usual Bangladeshi/Sylhet fayre I’m used to. Amazing flavours and such variety. And, as expected, a warm welcome and great company. Before I knew it, it was past three o’clock and I was ready to head off again, this time towards Teesside to see Mandy. I had to stop for a little while at the services and there I finally got around to joining the AA. I had meant to do it before leaving the island but their site was down the night before I set off. Had to do it all over the phone and was nearly tempted to go for the monthly payment deal they had which would have given me the tow home option as well, but when she gabbled the terms and conditions at me I queried the bit about services and she confirmed that I had to get the car serviced annually to be eligible for the bit where they pay for stuff to be done if they can’t do it. No thanks – I can’t afford to get my car serviced, let alone do the stuff they suggest needs doing. Got basic roadside cover. Had a lovely hour with Mandy chatting – nice biscuits too! – and was amazed by her incredible collection of dragons. Soon I was off again, travelling further north. I arrived with Jane in Whitley Bay at around half past eight (I think! – I’m getting behind with these blogs and I’m losing bits – knew this would happen). On the way I could see the dark figure of the Angel of the North alongside the road but didn’t dare stare at it for too long while I was driving. Quite exciting though – and it was a little spooky in the dark. Jane’s mum was staying with her so it was nice to meet her for the first time. Once again the plan for an early night was thwarted by ‘second wind’ and good conversation. Didn’t take many photos today – too busy travelling.